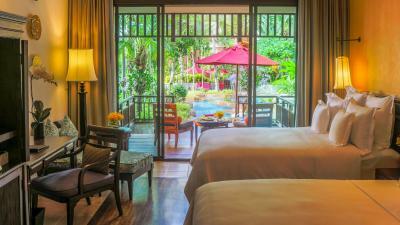 Lock in a great price for InterContinental Pattaya Resort - rated 8.6 by recent guests. Lovely grounds and pools with a nice view, and very comfortable beds. Each room has nice privacy and the bathrooms were very nice. Bottled water was complementary throughout the resort which was a nice gesture. Bed is too soft & very uncomfortable to sleep! Pillows are also very soft & very difficult to sleep!! The food is ecelent, the staff is the best we ever saw. They were helpful, kind, absolutley amazing. The staff were very accommodating and happy, the breakfast buffet was excellent with a wide variety of food and the resort was very clean. Happy hour was good too! Breakfast was excellent. Service and attitude as well. Big and clean room, fantastic pools. Restaurants were great. Great variety of food. I could not believe I was going to Pattaya on my way to Ko Samed. We managed to find this lovely resort with the flair of Thai feeling. We had the most beautiful room 353 with view. We loved the Beautiful design and Lovely staff. 1. Big room 51 square meters, very comfortable. 2. Nice breakfast breakfast is included, and there were many choices. 3. Nice environment It is about 1,5 KM away from walking street, very nice and quiet, and meanwhile it only takes you 10 mins to town. One of our top picks in Pattaya South.Boasting views of the Gulf of Thailand and a private white sand beach, InterContinental Pattaya Resort features 3 outdoor swimming pools, a large spa and a 24-hour fitness centre. Located in South Pattaya, this property is a 5-minute drive from the city centre and can be reached within 2 hours from Suvarnabhumi International Airport. Combining traditional Asian décor with modern amenities, the large rooms come with free WiFi, a flat-screen TV, and tea/coffee making facilities. Garden or ocean views can be enjoyed from the spacious private balcony. Guests staying in the Club rooms also enjoy exclusive privileges and access to the Club Lounge. 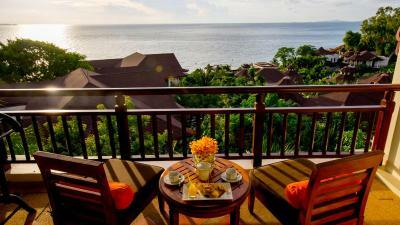 Views of the sea or the resort's gardens can be enjoyed from private balconies and pavilions. InterContinental Pattaya Resort offers free shuttles to downtown Pattaya. Guests can relax on sun loungers located around the resort. Families with young children can visit the kids' programme Planet Trekkers. Staff at the Activities Centre can arrange excursions and leisure activities such as day trip cruises to the nearby islands. Limousine and laundry services are provided. Offering indoor, outdoor and beachfront seating, Mediterranean-themed Infiniti Restaurant features wood-fired, grilled specialities and locally-inspired cocktails. Elements Restaurant serves international dishes, including Thai and Asian favourites. Guests can also relax with a refreshing cocktail at the Latitude by the Beach lounge. InterContinental Pattaya Resort has been welcoming Booking.com guests since 2 Apr 2012. 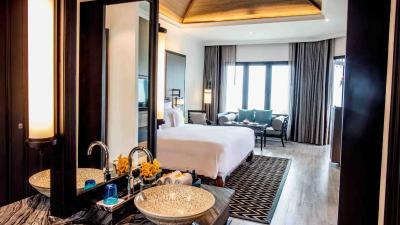 When would you like to stay at InterContinental Pattaya Resort? 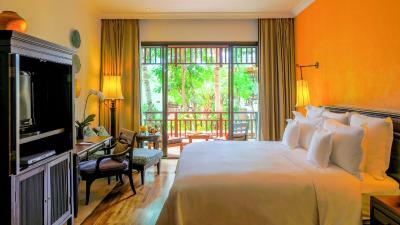 This spacious room is fitted with a secure private balcony overlooking the lush gardens of the resort. The room comes with a king bed and a seating area for private dining. Rollaway bed is available at an extra charge. Boasting views of the garden and easy access to the resort's free form pools, this king room offers a king bed and a private sundeck with sun loungers. Other facilities include free WiFi and coffee/tea maker. This bright and spacious room features a secure private balcony overlooking views of the sea. Featuring a king bed, the room also comes with free WiFi and a coffee/tea maker. Rollaway bed is available at an extra charge. This spacious room features a secure private balcony overlooking views of the lush gardens. Featuring a king bed and a queen bed, the room also comes with free WiFiand a coffee/tea maker. This bright and spacious room features a secure private balcony overlooking views of the sea. Featuring a king bed and a queen bed, the room also comes with free WiFi and a coffee/tea maker. This bright and spacious 51-sqm room features a secure private balcony overlooking views of the gardens. Featuring two queen beds, the room also comes with free WiFi, a coffee/tea maker and a CD/DVD player. Rollaway bed is available at an extra charge. This room features views of the gardens and easy access to the resort's free form pools. Offering two queen beds, this room also comes with a spacious sundeck with sun loungers. Other facilities include free WiFi and a coffee/tea maker. This bright and spacious room features a secure private balcony overlooking views of the sea. The room comprises of two queen beds. Other facilities include free WiFi and a seating area. Rollaway bed is available at an extra charge. This luxurious room offers a private outdoor pavilion and easy access to the resort's free form pools. Featuring a king bed or two queen beds, this room also comes with an over-sized bathroom fitted with a bathtub. The room is inclusive of full amenities and club privileges, such as exclusive access to club lounge, private check-in/out, etc. This luxurious room has a private outdoor pavilion with views of the sea. Featuring a king bed or two queen beds, it also comes with an over-sized bathroom fitted with a bathtub. The room is inclusive of full amenities and club privileges, such as exclusive access to club lounge, private check-in/out, etc. This room features a private pavilion overlooking views of the gardens. It also includes an exclusive access to the private club lounge. This double room has a pavilion with a balcony overlooking panoramic views of the sea. It also includes an exclusive access to the private club lounge. InterContinental Pattaya Resort is located on a cliff headland overlooking the Gulf of Thailand. A comfortable of guest rooms feature modern amenities with contemporary design. The restaurants offering relaxed dining and a lounge with mix and match the romantic ocean views. The facilities include the swimming lagoons, Spa, and fitness centre. House rules InterContinental Pattaya Resort takes special requests - add in the next step! InterContinental Pattaya Resort accepts these cards and reserves the right to temporarily hold an amount prior to arrival. Ocean near the beach was rocky so we were not tempted to swim there. Our room smelled a bit musty when we first checked in, but that got better over the course of the 2 days. Rooms were a bit dark. no possible to swim in the sea (it was not mention before we made the reservation). A lot of steps on the site. There was no elevator to our room on the third floor, uncomfortable for a family with small children.